Good Low Carb Snacks On The Go – Top 10 Picks! So you’re saying “no” to carbs and you’re doing great, and all of a sudden you realize that you have a road trip headed your way and your usual tote full of carb loaded tastiness isn’t going to cut it. What do you do when you’re looking for atkins diet snacks? Have no fear. Just because low carb fast food options are limited to overpriced salads doesn’t mean you have to starve on your summer road trip, just pick up some of these good low carb snacks to throw into you’re oversized mom bag and you’ll be all set! 1. Cheese Sticks: These are so not just for the kids. Cheese sticks are carb light but flavor-full, and although you probably won’t have time on the go to lovingly pull each strand of packed mozzarella, you’ll still get the goodness of this tasty treat. 2. Nuts: Nuts will require you to do a little label checking to ensure that you aren’t getting factory added sugar, but nuts in general are great low carb options. Look for almonds or peanuts, but avoid cashews which pack twice as many carbs. Remember, if it’s covered in chocolate, it’s not a low carb snack, so resist your urges! 3. 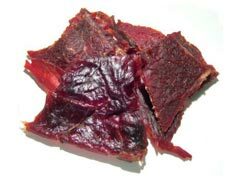 Beef Jerky: Is there a better selection for good low carb snacks? No way. Although not vegan friendly, beef jerky is a phenomenal low carb snack that’s packed with protein. 4. Raw Veggies: Whether you like it or not, veggies travel extremely well and can’t be overlooked as a super on the go food. Cut up celery, carrots, cucumbers and broccoli before you depart for a healthy snack. 5. Pork Rinds: you’re on a low carb diet not a low fat diet right? Believe it or not, these fluffy fried wonders aren’t as packed with calories as you might think and their airy consistency means you might even be able to pop enough to put a dent in the emptiness of your groaning belly. 6. Seeds: You don’t have to be a baseball player to enjoy sunflower or pumpkin seeds as good low carb snacks. The only down fall of this on the go food? Where to put the pesky shells. We’ll leave that conundrum up to you. 7. Dill Pickles: While you may find it silly to walk the boardwalk toting a giant dill pickle or getting passed in traffic munching on this tasty treat, remember you can slice and bag it for a great on the go snack. 8. Tuna Pouches: Tuna no longer requires can openers and smelly juice draining. Nowadays tuna is a portable and tasty treat. Especially since now you can pick up pouched tuna in a variety of flavors meaning that those carb loaded crackers just became optional. 9. Meal Replacement Bars: While not all of the best meal replacement bars are Akins friendly, many are and the labels will tell you so. These can also be pretty filling, meaning an added bonus for you. 10. Grape Tomatoes: Don’t get too excited, no grapes here. Veggies are of course good low carb snacks, and so is this cleverly disguised fruit. Because they don’t need slicing, they are portable and can be bagged or thrown into a storage container. Atkins Protein Bars Ingredients Could Make You Sick!